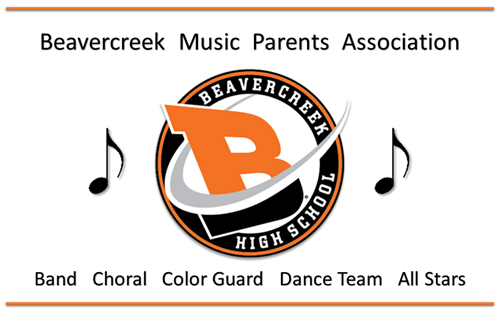 All parents from the Band, Color Guard, Choir, Show Choir and Dance programs are members of the Beavercreek Music Parents Association (BMPA). Our purpose is to support the various High School Music Department activities through various fundraising efforts (contributing significantly every year to each of the music programs) and providing parental support to many events. The association is organized for charitable purposes under Section 501(c)3 of the Internal Revenue Code. BMPA has a number of coordinator positions which need shadows! More details on how you can help. Big Amazon Shoppers? Support the band by using Amazon Smile, Set this as your new amazon bookmark! Other ways to raise money. BMPA Meetings are held the first Monday of each month (with a few exceptions) and all parents are encouraged to attend meetings and participate in the various activities. All of the events are great fun, provide an opportunity to meet other parents and benefit our children. We are successful because of you - our volunteers! We look forward to seeing you over the course of the coming school year. OMEA selects the BMPA as recipient of the 2018 Outstanding Music Support Group Award! Concession Stand Volunteers needed -- Now using SignUp.com to sign up for our biggest fundraiser- please check your calendars and plan on helping at several events! GoodSearch/ GoodShop Internet Fundraiser Information now available!